I love spare ribs no matter what time of year it may happen to be and for me living in a condo, I can’t really do any grilling of ribs anyway so I turn to making them in the oven to get the best results. i have a standard recipe that I have used often but I was looking for something a little different this time to maybe get a different flavor. I came across this recipe from theKitchn, a blog that I check out often. They offered up a very simple recipe for cooking great ribs indoors any time of year with a nice smoky flavor and a little zip to them. Line a baking sheet with aluminum foil and set a rack on top of the foil on the baking sheet. Lay the ribs on top of the rack in a single layer. This will allow for the heat to better circulate on all sides of the ribs so they cook evenly. Mix the Dijon mustard and the liquid smoke in a small bowl and brush the mixture on both sides of the ribs. Sprinkle the ribs with the dry rub and pat the ribs gently to make sure the rub adheres well to the rib meat. For an even deeper flavor, try doing this step a day ahead of time and wrapping the ribs in plastic wrap and refrigerate them until the next day. Heat the broiler and place an oven rack a few inches right below the broiler heating element. Make the meaty side of the ribs is facing up. Broil the ribs for about 5 minutes, until the sugar in the dry rub is bubbling and the ribs are evenly browned. Heat he oven to 300 degrees. Move the ribs to an oven rack set in the middle position of the oven. 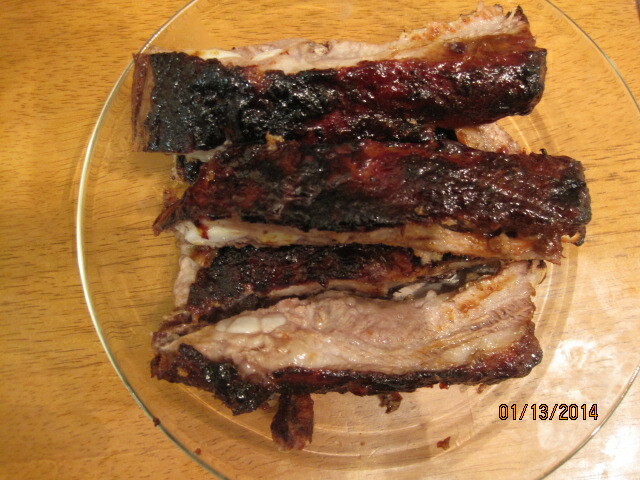 Roast the ribs for 2 1/2 to 3 hours for spare ribs or 1 1/2 to 2 hours for baby back ribs. Halfway through the cooking process, cover the ribs with aluminum foil to protect them from drying out. Remove the foil from the ribs and brush the ribs with barbecue sauce. Place the ribs back in the oven and continue to cook them for another thirty minutes. The ribs are done when a knife slides easily into the thickest part of the rib meat. Allow the ribs to rest, covered with foil, for about ten minutes, and then cut between the bones to separate the individual ribs. Serve with extra barbecue sauce for dipping. There are all kinds of spice rub recipes you can use for your ribs, and I have given the link to the one I use most often, but you can also buy some from the store if you have a personal favorite. I actually used a rub that was sent to me by Pepper Mary, who sells spices on her website. I used the Mesquite Blend, which was perfect for the ribs and added a nice mesquite wood flavor to the meat. This is a perfect spice blend for ribs or pulled pork if you are looking for something easy to use. Adding the liquid smoke makes a big difference in the smell and flavor as well. This recipe is very easy to do if you want ribs any time of year and don’t have a gas or charcoal grill to use. 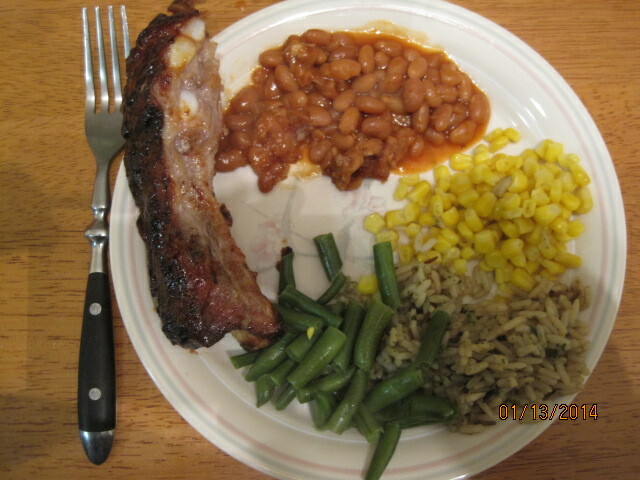 Any of the typical rib sides are perfect for this meal, such as baked beans, corn bread or cole slaw or even homemade fries.